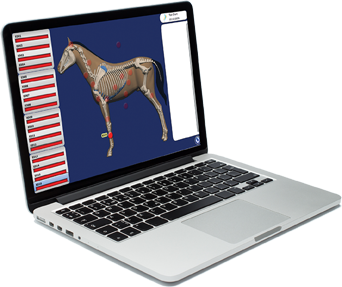 STEP ONE IS THE GROUND-BREAKING SOFTWARE VETVISION - THAT LETS YOU SEE THE UNSEEN With a single click, and in seconds, it returns a richly detailed overview - including multiple screens and physiologically accurate graphics. See your horse, dog or cat: get well - stay well - excel! AND INFORMATION THERAPY: VetVision returns recommended protocols to stimulate the animals innate self-healing ability. PEMF therapy reduces pain and speeds up healing by stimulating stem cell production. Resolves performance issues in health animals and aids recovery after injury or illness. Relieves soreness, stiffness, arthritic conditions, ligament, tendon, muscle or bone injury. It's backed by more than 30 years of scientific research and over a decade of human studies. It's also widely used in the treatment of bone fractures and torn tendons. Enhances the synthesis of protein cells, allowing the body to take advantage of all protein available. And more! Complete form for contact information. NES Health Remote Scan for Human's and Animals - No need to leave the comfort of your location! The Home WellNES system is easy to use. Clients perform their own scans with a remote scanning device connected to a computer, which takes about 20 seconds. With a click of a button, the scan is automatically transmitted to their NES Health practitioner, who reviews the scan information with them over the phone or internet, and creates a personalized protocol to correct and rejuvenate the body's energetic control system. Complete form and you will be contacted. Namaste! UltraMito Products For PetsA Little Drop Goes a Long Way to Better Health. A Dog is the Only Thing That Loves You More Than He Loves Himself.